If your fireplace dampers are damaged or broken, you’ll need a replacement. Get a free quote now and join thousands of other happy homeowners who have trusted Early Times. Have you ever noticed drafts coming from your fireplace? Then you’re probably in need of a new fireplace damper. Fireplace dampers are an integral part of your fireplace and your home’s energy efficiency. When Chicago homeowners need a new fireplace damper, they come to the experts at Early Times Home Solutions – we’re Chicago’s best chimney and fireplace company. We’ll inspect your chimney and fireplace and find any underlying problem, including a worn out or broken damper. Get a free quote now and see why thousands of homeowners have trusted Early Times with their fireplace and chimney projects. First, you must know what a fireplace damper is and its purpose. Fireplace dampers are found at the throat or top of your chimney and seal the fireplace shut when it’s not in use. When you’re ready to use your fireplace, it’s important to make sure the damper is open. If your damper isn’t open, it creates a blockage in your chimney. This will prevent smoke from rising out through your chimney and keep it in your home. It can be very dangerous to breathe in smoke and damaging to your home so always make sure your damper is open before using your fireplace. Now that you know what dampers are, you’re probably wondering why they’re so important. Fireplace dampers offer many benefits to homeowners that are often overlooked until their damper is damaged or broken. When you’re not using your fireplace, you need to make sure the damper is closed. This prevents drafts from coming down your chimney and into your home. It also stops your heated or cooled air from escaping through your fireplace. Closing the damper will make your home infinitely more comfortable. Comfort is great, but closing your damper will also save you money on your energy bills. When you prevent outside drafts from getting in and you retain your heated or cooled air, the furnace and air conditioner don’t have to work as hard to reach your desired temperature. This means they’ll use less power which will be reflected in your heating and electric bills. What happens if you don’t open your chimney damper when you use your fireplace? The smoke from burning a fire gets trapped in your chimney and starts to pour into your home. This isn’t good for your health or furniture. As you can see, having a damper that can easily be opened and closed is very important for your wallet and your health. How Can You Tell Your Fireplace Damper Isn’t Working? Fireplace dampers can become damaged over time due to the heat, smoke and being opened and closed. This leads to cracks and damage that can cause it not to work correctly. You need to make sure your damper is in one piece and fits snugly in the chimney. Another common problem with fireplace dampers is that they can get stuck. That means they won’t be able to open and close properly which you already know is bad for your home. This is an easy problem to detect since your damper won’t move when you try to open or close it. Older fireplace dampers might not fit properly overtime and leave gaps that drafts could sneak into your home through. This defeats the purpose of having a damper in the fireplace because their entire job is to make sure that your home is energy efficient. This means that you need a new chimney damper immediately. Some fireplace damper problems go undetected so it’s important to have a chimney inspection done once per year. You can’t just look up your chimney and see the problems, you need to hire professionals who can spot them for you. If you need a fireplace damper, call the experts at Early Times Home Solutions. 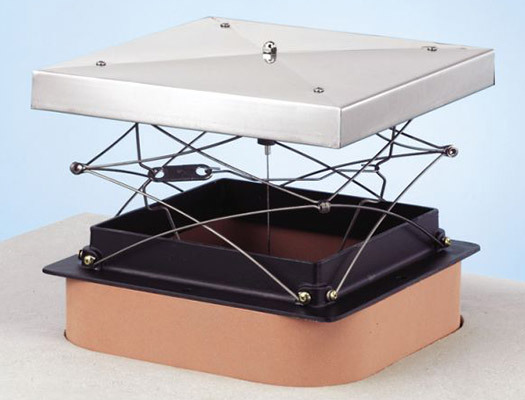 We offer high quality fireplace dampers for any size chimney. It’s important to make sure your damper is working properly and drafts aren’t getting into your home. Early Times offers lock-top dampers because they work better than other options. They seal at the top with a rubber gasket to make your home more energy efficient. Plus, there’s no metal-on-metal connections to worry about. If your fireplace damper is damaged or completely broken, don’t wait. Get a free quote now from Early Times so we can help you with your chimney damper needs.